Islamist commander Abdelhamid Abou Zeid has been killed in fighting in Mali, the French presidency has confirmed. Abou Zeid was a senior figure in al-Qaeda in the Islamic Maghreb (AQIM). Earlier, the French newspaper Le Monde said DNA samples had made it possible to formally identify Abou Zeid. The Chadian army fighting alongside French forces claimed earlier this month it had killed Abou Zeid and fellow militant Mokhtar Belmokhtar in fighting in February. "The president of the French Republic confirms with certainty the death of Abdelhamid Abou Zeid after an offensive by the French army in the Adrar des Ifoghas (mountains) in the North of Mali, at the end of February," the Elysee presidential palace said. The statement said the death of "one of the main leaders of AQIM marks an important stage in the fight against terrorism in the Sahel (region)". The fate of Mokhtar Belmokhtar has yet to be confirmed. Islamist rebels seized the vast north of Mali a year ago after a military coup in the capital Bamako. France intervened militarily in January amid fears that the militants were preparing to advance on Bamako. It currently has about 4,000 troops in Mali. Analysts say Algerian-born Abou Zeid became one of AQIM's top three military commanders in 2012 and led jihadist forces into the north Malian city of Timbuktu. Once there they swiftly imposed a harsh regime of Sharia law and organised the destruction of Muslim holy sites they considered idolatrous. Since the intervention began, major cities including Gao, Kidal and Timbuktu have been recaptured but fighting is still continuing in desert mountains. France plans to withdraw its troops from Mali next month, with West African countries expected to take over in the run-up to elections due in July. Correspondents say Abou Zeid, an Algerian, was believed to be behind several kidnappings of Westerners. He was also suspected of executing a British hostage, Edwin Dyer, in 2009 and French national Michel Germaneau a year later. 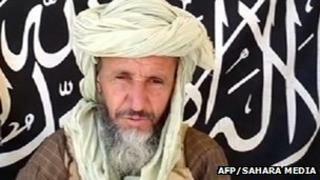 On Wednesday, AQIM said it had killed French hostage Philippe Verdon who was taken prisoner in Mali in 2011. It said his death - which France has not yet confirmed - was in retaliation for France's intervention in Mali. As well as Mr Verdon, a total of 14 French nationals are still being held by Islamist groups in Africa.